Bogor, from April to June 2015. The experiment used a randomized complete block design with two factors; the first factor was types of manure, i.e. chicken, cow, and goat manures; the second factor was manure rates, i.e. 0 and 10 ton.ha-1, so there were six treatments in total, replicated three times. N, K, and C/N ratio in soil significantly, but mustard green production was not affected. The diversity of microbe population of the soil treated with all types of manures was high. The addition 10 ton.ha-1 of manures decreased the total number of microbes, but increased the number of cellulose-degrading microbes. The population of cellulose-degrading and phosphate-solubilizing microbes in the soil applied with cow manure was higher than those applied with the other manures. Adiku, S.G.K., Narh, S., Jones, J.W., Laryea, K.B., and Dawuona, G.N. (2008). 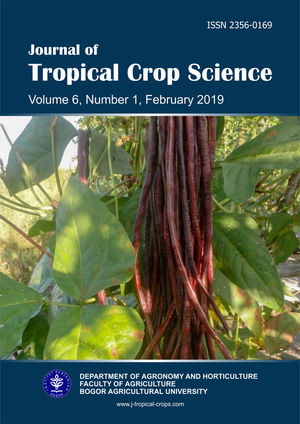 Short-term effects of crop rotation, residue management, and soil water on carbon mineralization in a tropical cropping system. Plant and Soil 311, 29-38. Barus J. (2012). Pengaruh aplikasi pupuk kandang dan sistem tanam terhadap hasil varietas unggul padi gogo pada lahan kering masam di Lampung. Jurnal Lahan Suboptimal 1, 102-106. Diacono, M dan Montemurro, F. (2010). Long-term effect of organic amendments on soil fertility, a review. Agronomy for Sustainable Development 30, 401-422. Emmerling, C., Schloter, M., Hartmann, A., and Kandeler, E. (2002). Functional diversity of soil organism-A review of recent research activities in Germany. Journal of Plant Nutrition and Soil Science 165, 408-420. Eviati and Sulaeman. (2009).” Petunjuk Teknis Edisi 2: Analisis Kimi Tanah, Tanaman, Air, dan Pupuk”. 234 pp. Balai Penelitian Tanah. [IFA] International Fertlizer Industry Association. (1992). “IFA World Fertilizer Use Manual”. Germany. Hartatik, W. and Widowati, L.R. (2006). “Pupuk organik dan pupuk hayati”. Balai Besar Penelitian dan Pengembangan Sumberdaya Lahan Pertanian. Juan, L., Yan-Ting, Y., Xiang-Dong, Z., Jian-Jun, L., Zhi-An, and Bing-Qiang, Z. (2015). (2015). Microbial community structure and functional metabolic diversity are associated with organic carbon availability in an agricultural soil. Journal of Integrative Agriculture 14, 2500-2511. [Kementan] Kementerian Pertanian. (2015). “Statistik Produksi Hortikultura Tahun 2014”. 285 pp. Direktorat Jenderal Hortikultura. Kim, K. Y., Jordan, D., and McDonald, G. A. (1998). Effect of phosphate-solubilizing bacteria and vesicular-arbuscular mycorrhizae on tomato growth and soil microbial activity. Biology and Fertility of Soil 26, 79-87. Maruapey, A. (2011). Pengaruh jarak tanam dan jenis pupuk kandang terhadap pertumbuhan gulma dan hasil jagung manis. In “Prosiding Seminar Nasional Serealia 2011”, pp 123-129, Papua Barat. Napitupulu D. (2012). “Dinamika Populasi Mikroba Tanah dengan Sistem Pola Tanam Padi Kedelai pada Pertanian Organik”. 83 pp. Institut Pertanian Bogor. Richardson, A.E. and Simpson R.J. (2011). Soil microorganism mediating phosphorus avalaibility. Plant Physiology 156, 989-996. Sahwan, F.L., Wahyono, S. and Suryanto, F. (2011). Evaluasi populasi mikroba fungsional pada pupuk organik kompos (POK) murni dan pupuk organik granul (POG) yang diperkaya dengan pupuk hayati. Jurnal Teknologi Lingkungan 12, 187-196. Sharma, V.K. and Singh, R.P. (2011). Organic matrix based slow release fertilizer enhances plant growth, nitrate assimilation and seed yield of Indian mustard (Brassica juncea L.). Journal of Environmental Biology 32, 619–624. Silahooy, C. (2008). Efek pupuk KCl dan SP-36 terhadap Kalium tersedia, serapan Kalium dan hasil kacang tanah (Arachis hypogaea L.) pada tanah Brunizem. Buletin Agronomi 36, 126–132. Sutanto, R. (2002). “Penerapan Pertanian Organik”. Kanisius, Yogyakarta. Widyati, E. (2013). Dinamika komunitas mikroba di rizosfer dan kontribusinya terhadap pertumbuhan tanaman hutan. Tekno Hutan Tanaman 6, 55-64. Wu, M., H. Qin, Z. Chen, J. Wu, W. Wei. (2011). Effect of long-term fertilization on bacterial composition in rice paddy soil. Biology and Fertility of Soils 47, 397-405. Yang, W., Meng, F., Peng, J., Han, P., Fang, F., Ma, L., and Cao, B. (2014). Isolation and identification of a cellulolytic bacterium from the Tibetan pig’s intestine and investigation of its cellulose production. Electronic Journal of Biotechnology 17, 262-267. Zak, J.C., Willig, M.R., Moorhead, D.L., and Wildman, H.G. (1994). Functional diversity of microbial communities: A quantitative approach. Soil Biology and Biochemistry 26, 1101-1108. Zhong, W., Gu T., Wang W., Zhang B., Lin X., Huang Q., and Shen, W. (2010). The effects of mineral fertilizer and organic manure on soil microbial community and diversity. Plant and Soil 326, 511-522.